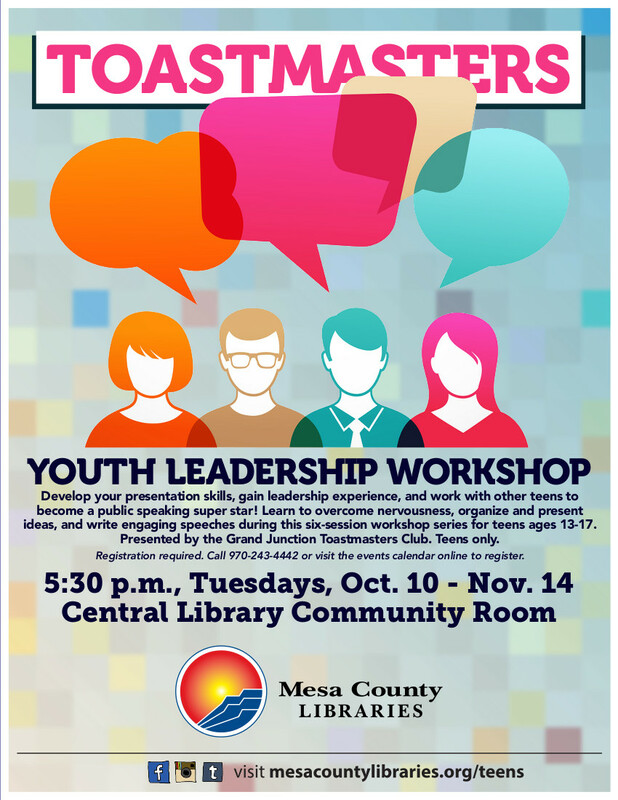 Toastmasters Youth Leadership Workshop, a six-week course for teens designed to develop presentation and leadership skills, will be offered six consecutive Tuesdays beginning Oct. 10, 2017, at the Mesa County Libraries Central Library, 443 N. 6th St., Grand Junction. The course, open to teens ages 13-17, helps participants develop communication and leadership skills through practical experience. In the training, participants learn to overcome nervousness, organize and present ideas, and write engaging speeches. Youth Leadership Workshop is conducted by volunteers in the Grand Junction Toastmasters Clubs. Materials used in the program are produced by Toastmasters International and are provided by local Toastmasters Clubs. The training takes place 5:30-7:30 p.m. each Tuesday from Oct. 10-Nov. 14, 2017. Attendance at each session is strongly encouraged. Space in the workshop is limited, and each participant will receive individual attention and will have the opportunity to gain practical experience. There is no charge to participants for this training. Advance registration for the course is required. Sign up by calling Mesa County Libraries at 970-243-4442 or by visiting the online Events Calendar.